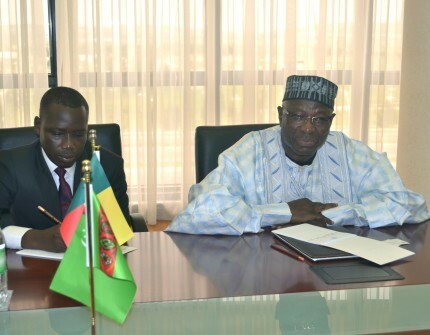 On the 18th of March 2019, a meeting between the Deputy Minister of Foreign Affairs of Turkmenistan and the newly appointed Ambassador Extraordinary and Plenipotentiary of the Republic of Benin to Turkmenistan (with residence in Ankara) Mr. Issiradjou Gomina Ibrahim was held in the premises of the Ministry of Foreign Affairs of Turkmenistan. In the beginning of the meeting, the Ambassador presented the copies of his credentials and expressed his readiness to work actively for the sake of development and strengthening of bilateral relations between Turkmenistan and the Republic of Benin. It was noted during the meeting that the appointment of the Ambassador Extraordinary and Plenipotentiary of the Republic of Benin to Turkmenistan proves that both countries are interested in the development of mutually beneficial relations. It is worthwhile to note that the improvement of ties with the African states is one of the directions of the external policy of Turkmenistan. Also, the parties stressed the presence of potential for the development of cooperation in political, trade-economic and cultural-humanitarian spheres. Talking about the significance of activities in the framework of international organizations, the United Nations in particular, the parties stated the necessity to continue the mutual support of peace-loving initiatives and projects aimed at the economic growth, as well as the maintenance of peace and stability in the whole world. The parties underlined that to widen bilateral ties, it is vital to activate bilateral visits on different levels. The proposals were made on establishing the necessary legal base for holding political consultations between the Ministries of Foreign Affairs. In the framework of developing the cultural-humanitarian cooperation, the significance of exchanging relevant delegations was noted. The possibilities of collaborating in the sphere of education, sport and tourism were considered. The parties also looked at the possibilities of improving cooperation between the business circles of the two countries. In the end of the meeting, the Ambassador of Benin expressed hope for further cooperation aimed at strengthening Turkmen-Benin relations.